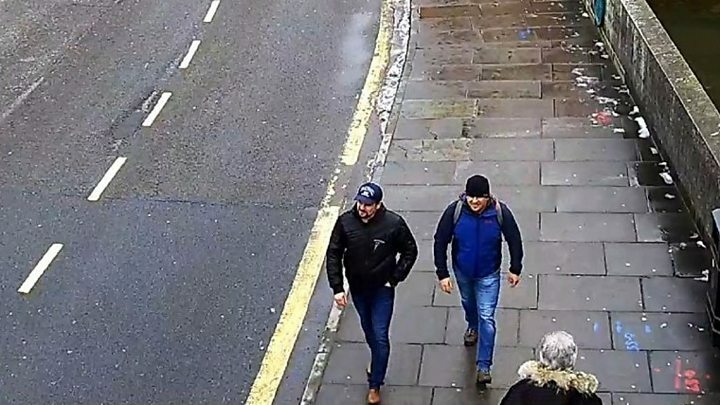 When the UK authorities announced on Wednesday that they suspected two alleged Russian agents in the poisoning of former Russian spy Sergei Skripal and his daughter Yulia in Salisbury, they released CCTV images of the suspects arriving at Gatwick airport. Two of the images, framed side by side, began to spread on social media, driven by pro-Russia conspiracy theorists and suspected troll accounts. 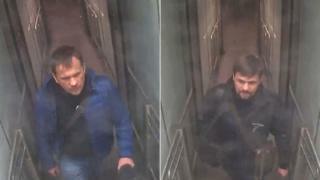 They showed the alleged agents - Alexander Petrov and Ruslan Boshirov - passing through a non-return gate at the airport. The images had identical timestamps. How could two men be in exactly the same place at the same time, a flood of tweets asked. Speaking on state TV, Russian Foreign Ministry spokeswoman Maria Zakharova claimed that either "the date and the exact time were superimposed on the image" or that Russian intelligence officers had "mastered the skill of walking simultaneously". Her remarks were echoed by pro-Kremlin accounts on Twitter and on the messaging app Telegram, which is popular in Russia. Users suggested the CCTV images had been manipulated. They mocked the British authorities and alleged it was an MI6 operation. Soon it would not necessarily matter that the background of the CCTV images were not identical; that the camera was at a different angle; that Google Maps shows that the non-return gates at Gatwick are a series of near-identical corridors that the two men could easily have passed down, adjacent to one another, at the same time. What would matter would be that some people following the story would begin to question what was real and what wasn't. Some might even begin to question the very idea that there was a real, reliable version of events at all. Russia denies any involvement in the Skripal case, and its embassy in London did not respond to a request for comment from the BBC, but analysts say the Russian state is now the chief exponent of a new kind of information warfare. A loosely-defined network of Russian state actors, state-controlled media, and armies of social media bots and trolls is said to work in unison to spread and amplify multiple narratives and conspiracies around cases like the Skripal poisoning. The goal is no longer to deny or disprove an official version of events, it is to flood the zone with so many competing versions that nothing seems to make sense. "What is really striking is that you no longer see the Russian machine pushing a single message, it pushes dozens of messages," said Ben Nimmo, a senior fellow at the Atlantic Council who studies Russian disinformation. "The idea is to confuse people." Other theories circulating on Wednesday included a claim that the suspects were British actors, stars of a (non-existent) KGB spy series broadcast on British television in the 2000s. Another suggested the attempted assassination in Salisbury, and the deaths of other Russian nationals in Britain, were part of an MI6 plot. "Why do all these horrible events only happen in Britain?" asked Andrei Klimov, a Russian member of parliament, on state TV. "The more different theories you put out, the more different Google results you're going to get," said Mr Nimmo. "So instead of seeing two or three different versions of the story you're seeing 20 or 30. And for someone who is not following the story regularly that becomes more and more confusing until they give up. And at that point, the Russian disinformation has had its effect." Early evidence of the tactic can be traced back to the 2000s but it first drew serious international attention in 2014, when Malaysian Airlines flight MH-17 was shot down over Ukraine, killing 298 people. The available evidence pointed to a Russian-supplied surface-to-air missile fired from rebel-held territory in east Ukraine. Russia had already been accused of deploying crude disinformation techniques around its actions in east Ukraine and its annexation of Crimea, but its response to being linked to the downing of MH-17 appeared to be much more co-ordinated - the "tipping point where Russian information warfare kicked into high gear", Mr Nimmo said. In the days and months after the aircraft was shot down, Russian state media and pro-Kremlin social media accounts pushed out a raft of different and wildly contradictory theories: that a Ukrainian Su-25 combat aircraft had been picked up by radar near MH-17; that video evidence showed a missile being fired from government, not separatist, territory; that Ukrainian fighters had mistaken MH-17 for Vladimir Putin's plane in an assassination attempt; that the CIA was behind it. "MH-17 is really the classic example," said Samantha Bradshaw, a researcher on computational propaganda at the University of Oxford. "You saw a whole series of different conspiracies and competing narratives emerge, attached to various hashtags and social media campaigns. The goal was to confuse people, to polarise them, to push them further and further away from reality." The tactic expanded and evolved in the years after the MH-17 attack, with Russia linked to disinformation campaigns around its actions in Syria, the 2016 US election, the murder of Boris Nemtsov, and a UK inquiry into the murder of former Russian intelligence officer Alexander Litvinenko in London. Media captionSalisbury Novichok suspects: What does Russia's media think? A key component in more recent alleged Russian disinformation campaigns has been the use of humour and ridicule. When a UK inquiry found in 2016 that Russian president Vladimir Putin "probably approved" the murder of Litvinenko, a hashtag - #putinprobablyapproved - spread through Twitter, with tweets suggesting Mr Putin had "probably approved" the assassination of JFK, the invasion of Iraq, climate change and more. In the hours after the UK named the suspects in the Skripal case, a flood of near-identical tweets used pictures of comedians, historical figures and Hollywood spies - from Joseph Stalin to Jason Bourne - in place of the suspects, in an attempt to ridicule the UK's announcement. 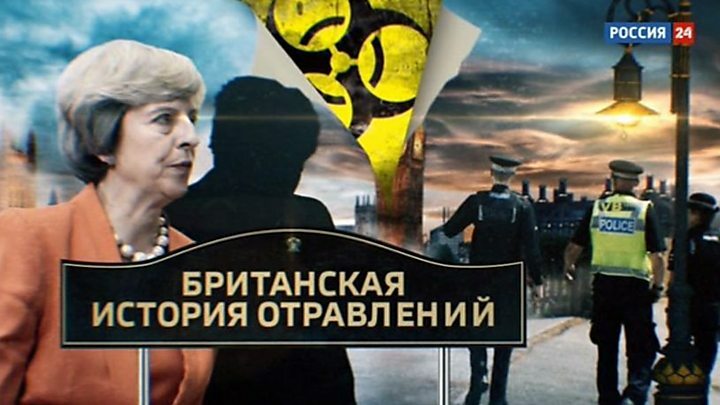 The official account of the Russian embassy in London even joined in, posting an image of the two Skripal suspects allegedly carrying the Novichok toxin alongside a picture of British police in biohazard suits, asking users to "spot the difference". On Russian state news bulletins, anchors reported the news with a mixture of disbelief and sarcasm. "The strategy is optimised for the internet, it's meant to go viral," said Mr Nimmo. "That's why mockery and sarcasm and attempts at funny memes are so much a part of this ... It is disinformation for the information age." In 2015, the European Union was sufficiently alarmed by Russian disinformation that it created a task force - the East Stratcom team - directed solely at counteracting the perceived threat. The small team attempts to debunk fake stories in real time, but it is reportedly vastly outmatched by the amount of material coming its way. Peter Wilson, the UK ambassador to the Organisation for the Prohibition of Chemical Weapons, said earlier this year the OPCW had counted more than 30 different Russian theories swirling around the poisoning of Sergei and Yulia Skripal. The effectiveness and reach of this type of disinformation operation in the West is debatable. A YouGov poll conducted earlier this year found that 75% of Britons believed that the Russian state was behind the Skripal poisoning, while just 5% said they thought Russia was innocent. But the sheer volume of Russian disinformation being exported abroad remained a major cause for concern, said one EU official who works on the issue but was not authorised to speak about it publicly. "Some people like to think this tactic was used around Brexit and it went away, or it was used around Skripal and went away, but it's happening 24/7," he said. "Others also use disinformation, of course ... But this aggression, this exporting of information narratives abroad, this is really something where Russia is number one in the world." Russian spy: What happened to Sergei and Yulia Skripal?